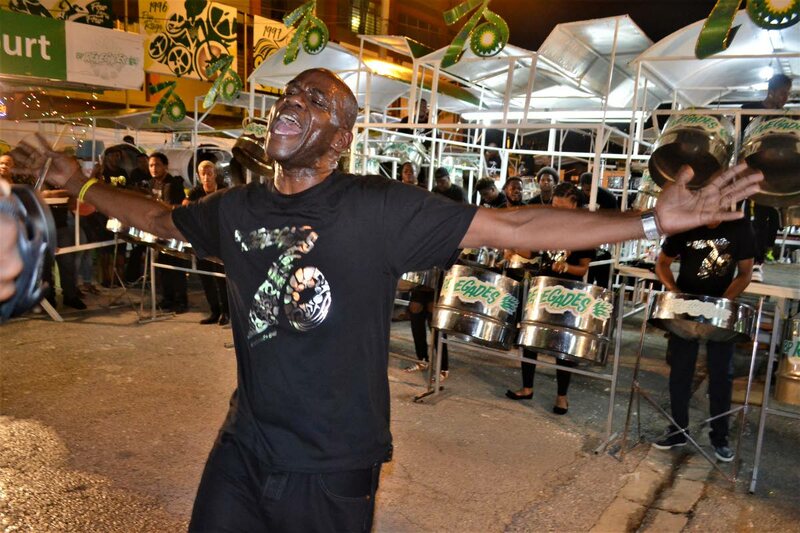 An ecstatic Duvone Stewart during a BPTT Renegades performance. File photo. BP Renegades topped the large bands preliminaries as 14 large and 14 medium bands moved on to the semi-final round in the annual Panorama competition. The results of the preliminary leg of the competition was released yesterday with Renegades topping the large bands with 264 points and playing Aaron “Voice” St Louis’ Year Of Love. Both Skiffle and Phase II Pan Groove (In partnership with HADCO) tied for second place with a score of 262 points. These top three bands will compete against eleven other bands at Sunday’s semi-finals at the Queen’s Park Savannah. Similarly, in the medium category, Pan Elders took the top spot with Limbo Break scoring 265 points. Courts Sound Specialists of Laventille, Petrotrin Katzenjammers and Power Stars having a three-way tie for second place with Swing, Lorraine and Stranger, respectively with a score of 258 each. These bands will also join eleven other bands in Sunday’s semi-finals. Thirty small bands have moved on to the semi-final from the preliminary stage with Laventille Serenaders, Golden Hands and Fascinators Pan Symphony topping the list. The draw for the large and medium band playing spots on Sunday will take place today at 11A Maraval Road, Newtown at 10 am. The semi-finals for medium and large bands takes place on January 28 at the Queen’s Park Savannah, Port of Spain, from 1 pm. Pan Elders; Courts Sound Specialists; Petrotrin Katzenjammers; Power Stars; NLCB Buccooneers; Curepe Scherzando; Sangre Grande Cordettes; Petrotrin Siparia Deltones; NGC Couva Joylanders; NLCB Valley Harps; Carib Dixieland; Pamberi; Potential Symphony and Arima Angel Harps. Reply to "Bands ready for semis"